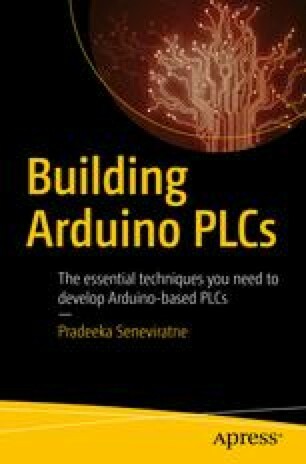 In this chapter, you learn how to control your Arduino-based PLCs through the Internet by connecting them to a cloud. In simple terms, cloud computing is using a network of remote servers hosted on the Internet to store, manage, and process data, rather than a local server or a personal computer. A cloud-connected PLC can be controlled through the Internet with automated or manual inputs. You can also monitor your PLC through the Internet, such as the input data and output data, in real time, or you can use external services to control your PLC.